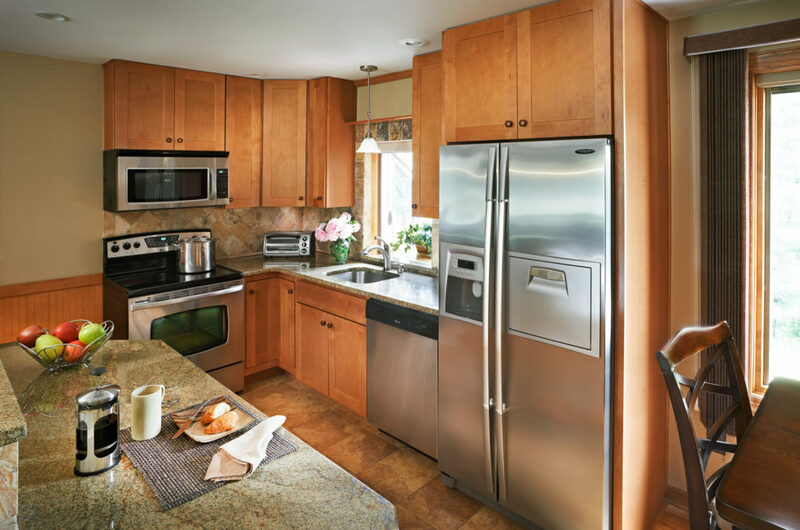 WOLF Classic Cabinets combine generations of woodworking expertise with today’s latest manufacturing technologies. Hundreds of skilled craftsmen work in two modern facilities to produce cabinets of exceptional quality and value. 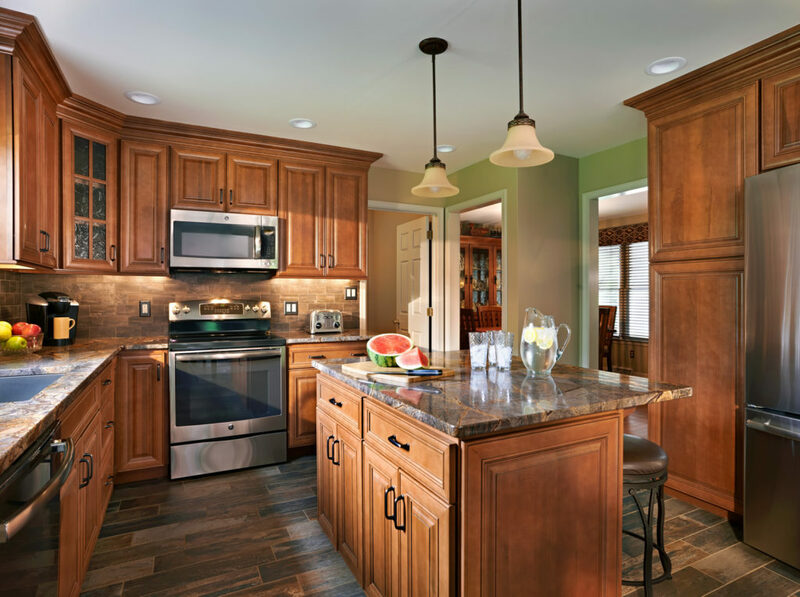 Solid wood components, including select doors and face frames, are locally fabricated from domestic hardwoods, creating dozens of additional jobs in nearby Midwestern communities. 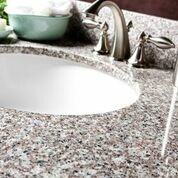 A state-of-the-art finishing system produces a consistently beautiful and long-lasting appearance. 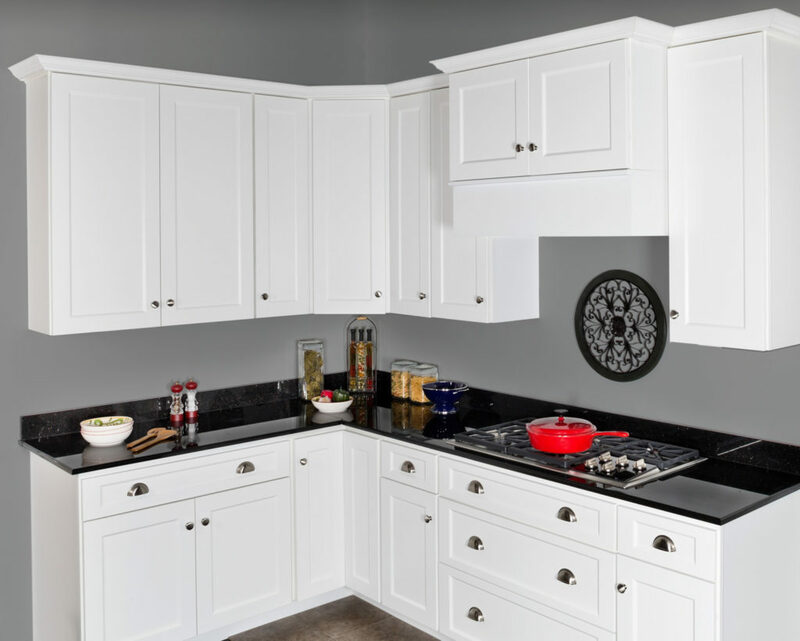 The result is an affordable, high-quality cabinet line with many features typically found in much more expensive cabinetry. 1. 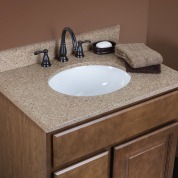 Cabinet fronts are made from 3/4″ solid maple wood. Front stiles are pocket drilled and assembled with 1-1/4″ screws for rugged durability. Bottoms are 1/2″ solid maple wood. 2. 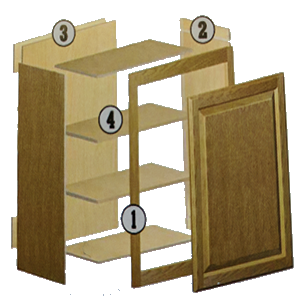 Side panels are 1/2″ plywood with matching exterior laminate-glued and stapled in a 1/2″ dado in the cabinet’s front frame. 3. Back panels are made from vinyl covered (inside only) 1/2″ plywood which is glued and nailed in a 1/2″ dado and stapled to the hang rail and cabinet bottom. 4. 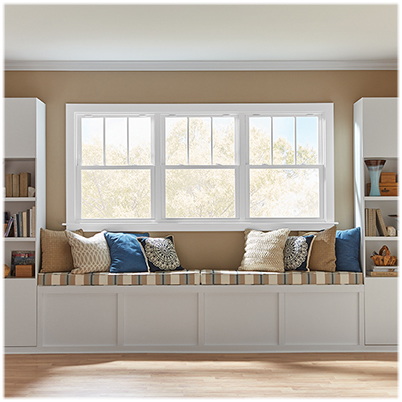 All wood 3/4″ corner blocks are installed on all corners. 5. Half-depth adjustable shelf of 3/4″ plywood with bull nosed, foil covered front edges. The shelves are held in place with self-locking clips on the sides. 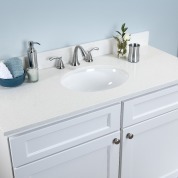 All cabinet front and door surfaces receive stain or paint and a catalyzed clear finish. 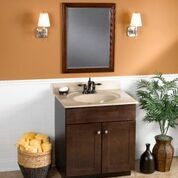 Our finish provides a deep, rich wood tone that is resistant to household chemicals, water, food stains and mild acids. 6. 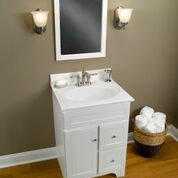 All drawers are constructed using 5/8″ clear finished wood with dovetail construction. Drawer bottom is 1/4″ plywood in a dado into drawer sides. Saginaw are side mount, standard epoxy glides. Dartmouth and Hudson are full extension, under mount glides with soft-close. 7. 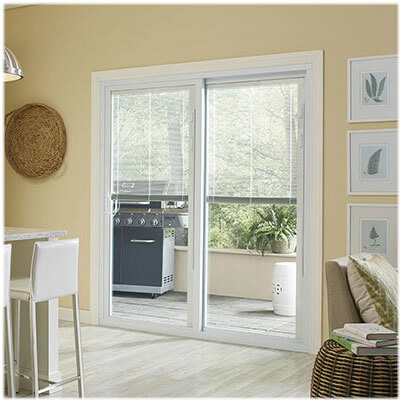 Saginaw come with hidden, six-way adjustable hinges. 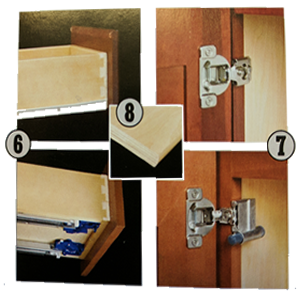 Dartmouth and Hudson come with hidden, six-way adjustable hinge with installed snap on soft-closing mechanism. 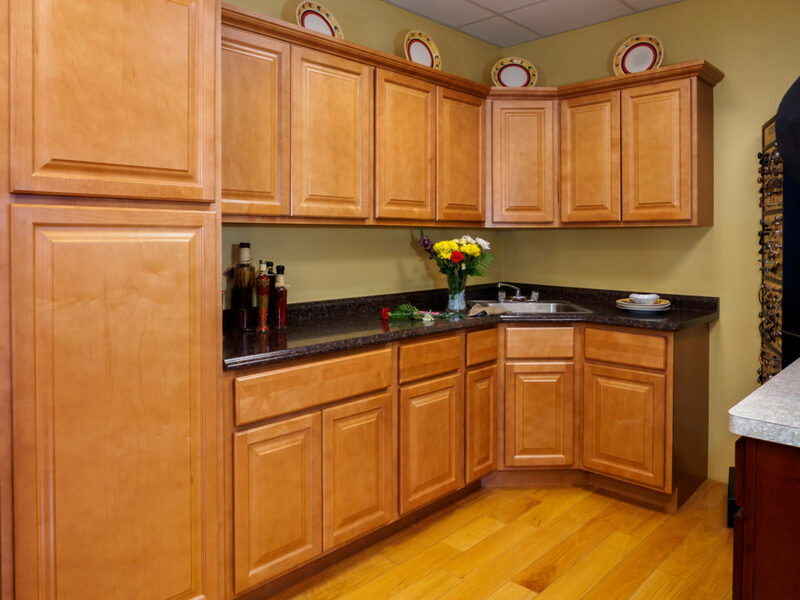 All cabinets that require handing are handed left (hinge is on the left when looking at the cabinet). 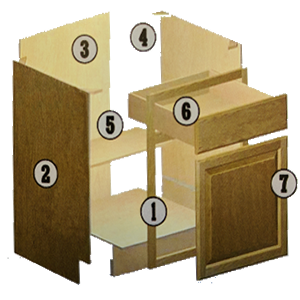 Wall cabinets can simply be flipped over to change hinging. For base cabinets, remove and flip door then screw to other side. 8. Adjustable 3/4″ plywood shelf with bull nosed, foil covered edges. The shelves are held in place with self-locking clips on the sides. 1. 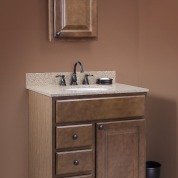 Cabinet fronts are made from 3/4″ solid wood. Front stiles are pocket drilled and assembled with 1-1/4″ screws for rugged durability. Tops are 1/2″ solid maple wood. 2. 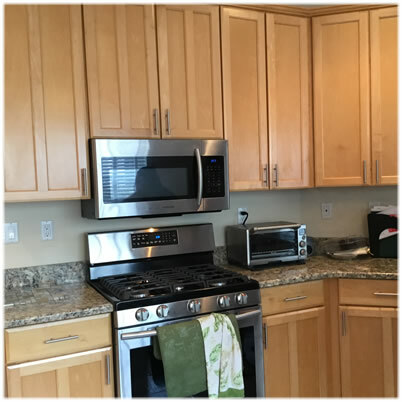 Side panels are 1/2″ plywood with matching exterior laminate and glued and stapled in a 1/2″ dado in the cabinets front frame. 3. 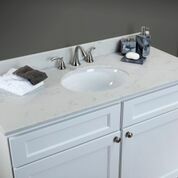 Back panels are made from vinyl covered (inside only) 1/2″ plywood and are glued and nailed in a 1/2″ dado and stapled to the cabinet tops and bottom. Plywood hanging rails are installed at both the top and bottom of the cabinet. 4. Adjustable 3/4″ plywood shelf wiht bull nosed, foil covered front edges. The shelves are held in place with self-locking clips on the sides.